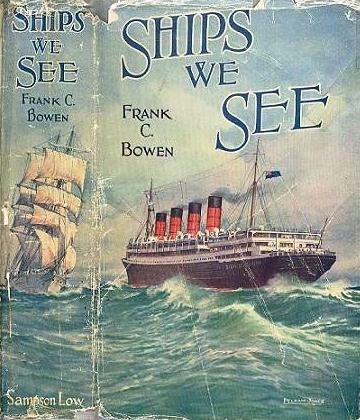 This page provides a complete list of articles written by Frank C Bowen, one of the Consulting Editors of Shipping Wonders of the World. He wrote all the articles in the series Going to Sea and Speed Under Sail. Frank Bowen devoted his life to maritime research and writing. His interest in ships began as a young boy. He was raised in the port of Ramsgate, where he had ample opportunity to indulge his interest in the sea. As a young man he was employed as a machine valuer, but continued to collect information on ships in his spare time. At the outbreak of war in 1914 he joined the Royal Naval Brigade and fought in the Dardanelles. From 1916 to the end of the war he worked in Naval Intelligence. Although he could not speak German, his depth of nautical knowledge was considered to be vital for the war effort. After the war he became a full time maritime journalist and writer. He lived for a time in London before moving to Gravesend, where he secured rooms at the Customs House. He was a well-known figure on the quayside where he would watch the ships on the River Thames. In the course of his work he acquired a large maritime library and an even larger collection of press cuttings, which soon took over a number of rooms at the Customs House, bound in approximately 1,000 volumes with card indexes. Bowen’s literary output was largely based on this ever-expanding collection. He published over 20 books on ships and shipping including classics like The Flags of the Southern Cross, The King’s Navy, Men of the Wooden Walls, Ships We See, Sailing Ships and the London River, and The Sea, Its History and Romance. He was also a regular contributor to Sea Breezes magazine. In 1954, owing to ill health, he sold his collection to the owners of the Sea Breezes magazine. Subsequently the press cuttings became separate from the indexes. In 1994-95 the cuttings and indexes were re-united at Southampton Reference Library with the wish that the collections be made available to the general public. The collection has since been microfilmed and is available for use within the Maritime Library as the “Frank Bowen Collection”. A useful brief bibliography of his major books has been posted here.